Dwight Eisenhower wasn’t only the 34th President of the United States. Before that, he was a five-star general in the Army, responsible for command of the Allied Forces in Europe during World War II. He was also the Supreme Commander of NATO and President of Columbia University. In other words, he was incredibly accomplished. Eisenhower’s productivity is legendary not only because of his accomplishments but also because his methods stood the test of time and worked in various situations. Through various roles and environments, Eisenhower delivered with remarkable consistency for decades. The Eisenhower Matrix is his best-known technique. It’s a simple decision-making tool that you can draw on a napkin and start using today. If you think about it for a second, you realize that the Eisenhower Matrix can help you not only with prioritizing what you work on today, but also with deciding which big projects to work on. The matrix helps you distinguish between what is important and what is urgent. Whenever something lands on your desk, begin by breaking it down and deciding how to proceed. 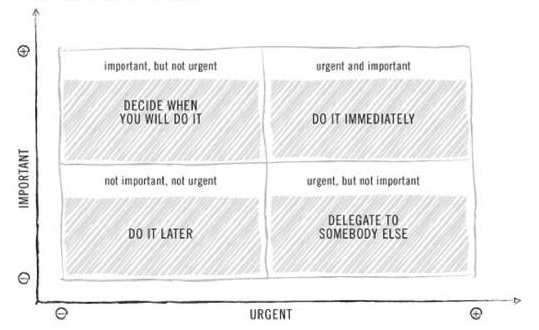 The key to making the Eisenhower Matrix work is distinguishing between the urgent and the important. Urgent tasks are time sensitive, sometimes because we have put them off until we can’t anymore. These tasks can be anything from responding to emails and returning phone calls, to realizing that you’re almost out of gas and have a report due in 20 minutes. If we’ve put off doing an urgent task that’s also important, then when we finally tackle it, we’re probably not going to think about it as much as we had intended to or as much as we should. We’re setting ourselves up to make poor decisions. Whether or not they used to be important, urgent tasks cause us to be reactive. We’re stressed. We’re full of anxiety. As a result, we’re rarely thinking optimally. Rushing through things often causes poor decisions that reverberate into the future, destroying our future productivity. We have to spend large amounts of time fixing problems that were caused because we were reactive and rushed. Important tasks are more strategic. They are things we want to get done, such as launching a new product. These tasks are deliberate. We want to pay attention to them and they mean something to us. Rather than being reactive and irrational, we can, with the right planning, be thoughtful and engaged. Because we’re not reactive, we can avoid mistakes. This will free up future time. The default for most of us is to focus on what’s urgent and important. It’s only natural that we’d want to focus on the things that need to be dealt with immediately. In so doing, we tend to crowd out things that are important but not urgent. Ask yourself when you’re going to deal with things that are important but not urgent. Ask yourself why you’re avoiding what’s important but not urgent. Are you scared of something? Are you procrastinating? Are you too distracted? I use this matrix routinely as part of my productivity system. It’s helped me stay focused on where I want to go and not get too bogged down in things that don’t add much value. The conventional wisdom is that you should do the next thing on your to-do list. In practice, I use the Eisenhower productivity system differently. First, the bar to become a task I’m even thinking about is pretty high. Rather than do it later, non-important and non-urgent tasks are usually just dropped. Occasionally they’ll bounce and I’ll pick them up again. Important and non-urgent tasks are scheduled and generally worked on in the early afternoons. Important and urgent tasks are worked on right away or scheduled, and are always evaluated. While I can’t plan for everything, when things get piled up here, it’s often because of a breakdown in the system — something went wrong. The urgent and not-important tasks are usually, though not always, delegated. Delegation is a bit of a tricky subject for knowledge workers. As an advisor to several companies, I generally advocate that companies never outsource their core businesses. Among other things, doing so makes you dependent on the goodwill and competence of others. You become fragile. The key to the way that I use this in practice is my mornings are always blocked off from 0830 to 1130. This gives me three hours to focus on important (urgent and otherwise) tasks. I don’t have to find the time to fit them in, it’s already there. Still curious? Check out The Decision Matrix: How to Prioritize What Matters. Image from The Decision Book: 50 Models for Strategic Thinking.